In order to implement reinforced masonry as a cost-efficient building in Egypt, Design Code and Standard Specification for masonry should be developed. This requires long-term research effort in this area to provide an adequate data base for the design procedures this paper is a contribution to that effort. Failure characteristics and load carrying capacity of reinforced masonry shear walls depends mainly upon the level of axial precompression, masonry strength, wall geometry, boundary conditions, and size and locations of openings. 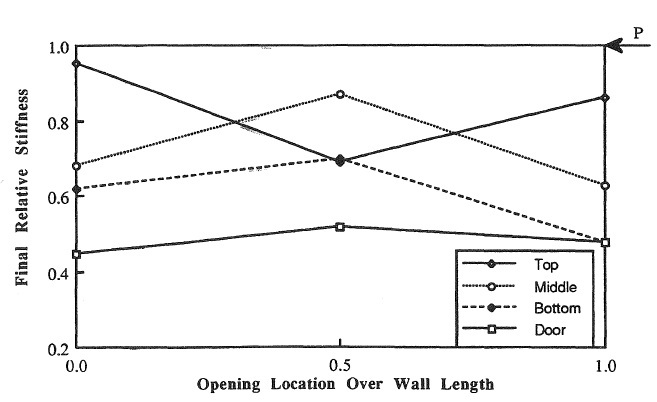 This paper presents only the effect of openings size and location on the behavior of reinforced masonry shear walls. The analysis of such shear walls is based on two-dimensional, four nodes parabolic isoparametric quadrilateral finite element with idealized nonlinear stress-train relations for reinforced masonry, In this program the masonry and reinforcement are modeled separately and their interaction is included by using for node isoparametric plane stress overlay element occupying the same space. The results show that the location and size of openings have a significant effect on failure mode, stiffness, load deflection curve, and ultimate strength of shear walls.